Fake Facebook Birthdays: What happened when I celebrated my Facebook birthday on July 11. And July 25. And July 28. What happened when I celebrated my Facebook birthday on July 11. And July 25. And July 28. Good manners, of course, are just artifice—formalized rituals, designed for social lubrication, that mean nothing. From the cotillion curtsey to the subway-train “excuse me,” they create automatic mechanisms for encountering strangers and papering over conflict. They are false, but they are necessary. Yet there is one manifestation of good manners that appears to have exactly the opposite purpose, a form of social lubrication that makes a mockery of everyone connected to it. I refer to the Facebook birthday greeting. The Facebook birthday greeting has become a symbol of all that is irritating about the social network. Every April 11 or June 7 or Sept. 28, your Facebook account suddenly chatters with exclamation-point-polluted birthday wishes. If you are a typical Facebook user, these greetings come mainly from your nonfriend friends—that group of Facebook “friends” who don’t intersect with your actual friends. The wishes have all the true sentiment of a Christmas card from your bank. The barrage of messages isn’t unpleasant, exactly, but it’s all too obvious that the greetings are programmed, canned, and impersonal, prompted by a Facebook alert. If, as Facebook haters claim, the social network alienates us from genuine friendship, the Facebook birthday greeting is the ultimate example of its fakery. My second fake birthday, two weeks later, was when things started to get strange. 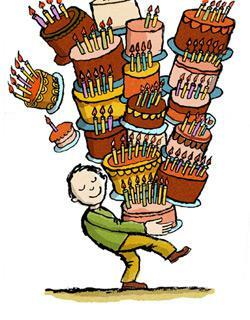 I received 105 birthday wishes on July 25, nearly as many as two weeks earlier. This time, nine people suspected something was awry. James P., for example, jibed: “It must be pretty nice having multiple birthdays each year, let alone in the same month!” But the skeptics were far outnumbered by profligate birthday wishers. Of the 105 birthday wishes, 45 of them—nearly half—came from people who had wished me a Facebook happy birthday two weeks earlier. The highlight of my second fake birthday? Playbook, Politico’sfamous Washington tip sheet, included me in its daily birthday greetings, prompting a whole raft of non-Facebook birthday wishes from D.C. insider friends. Even so, the repeat birthday greeters still trumped the doubters. Almost 30 people wished me a happy birthday on July 28 having already wished me a happy birthday on one of my previous non-birthdays. Sixteen people sent me Facebook birthday wishes on all three Facebook birthdays, not noting or perhaps not caring about the repetition. One friend even wished me four happy birthdays, congratulating me twice on one of my fake days. The messages from one of these three-time greeters, a friend I’ve never met named Barry P., were almost poignant. Don’t mistake my observation for derision. Mass electronic communication is destroying our memories, since we rely on devices to protect us from embarrassing ourselves. I routinely send an email to a friend on a Tuesday, and then send her exactly same email on Thursday. Even so, the Facebook fake birthday experiment did end up confirming my worst fears about the network. All too many birthday wishes are autonomic, sent without thought or personal feeling. It’s one thing to remember your friend’s birthday because you took him out a decade ago for his drunken 21st birthday debauch. It’s much lamer to “remember” your friend’s birthday because Facebook told you to. A significant number of Facebookers clearly use the service without sentiment, attempting to build social capital—undeserved social capital—with birthday greetings that they haven’t thought about based on birthday memories of you that they don’t actually have. And yet my three-birthday July was not completely demoralizing. An encouraging number of my friends—many of them my actual friends—were so socially alert that they cottoned on to my manipulation of the Facebook birthday system. And these friends who saw through my experiment didn’t let it darken their mood or cause them to spread ill will: Almost everyone who recognized that my birthday was bogus wished me a Happy Birthday anyway, like Eileen H.: “Did I not just wish u this? Well, hbd s’more!” They sought to increase good feeling in the world—and toward me, even though they knew I didn’t deserve it.